Theo Walcott's contract extension has been a topic of discussion with major contrast amongst Arsenal fans the last few days. Two and half years ago he signed a contract extension worth £100K a week - the negotiations dragging out in quite a dramatic style. Having been brought up observing the classy way in which Arsenal do business, I don't think any of us were used to the way the 2013 negotiations unfolded. Untidy, noisy, drawn out and worst of all, not private. As much as we'd all like to know everything that goes on behind the scenes, there's something romantic about the way Arsenal, as a club, do things so quietly. It gives the perception (accurately) that our club operates properly and in a classy way. The less given to the media, the better. 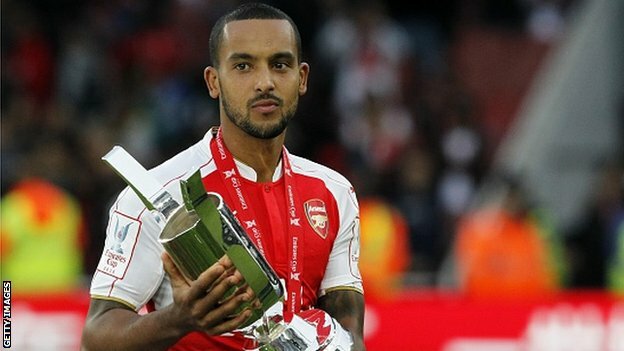 The last time Theo Walcott signed a contract with Arsenal it felt a bit like we were being taken advantage of and at our club, more than most, there is no player bigger than the club (the argument can be made for Henry, but as such a humble fella I doubt he'd enjoy that responsibility). The Walcott situation is one that is not only seemingly a 50/50 opinion, but an opinion that isn't set in stone with most Gooners. I have to admit, when last season drew to a close I had come to the assumption that Theo would either drag us through the mud a bit to get what he wanted or he would be sold, and probably for a decent chunk of change too. So I wasn't devastated with the prospect of losing the Englishman, at least not on the cheap. Watching this most recent contract 'saga' get wrapped up so quickly and efficiently is something I think I'm pleased with. You can make an argument that he is injury prone, and as much as I want to say he's just unlucky, I think that argument is legitimate. In Theo's defense, it was evident to everyone that he had really bulked up after his last injury lay off and looked not only a better player but a stronger one, too. To be barely 5ft 9in in the Premier League you've either got to be really, really fast or strong enough to take a tackle. To have both in Walcott would be tremendous and hopefully, at 26 Theo has grown into that player. After a brief and successful contract negotiation I don't think the argument of loyalty can be thrown about any longer. Sure, he was a Liverpool fan when he was 6 and maybe Liverpool needed a Sterling replacement but he's shown his commitment by signing and playing his socks off since he's been back from injury. One of the bigger debates will be wether he's now making more than he's really worth. He's English, so let's be honest - he's always going to be making more than a foreign player of his quality will be making. He's not young anymore - he's been playing for us for a decade so the investment should be paying off by now. At 26 he should be entering his prime so the expectation for a solid season will be heavy. If he wants to be making that big money he's going to have to deal with that heavy weight of expectation that the big money players do. At the end of the day we can, and have, signed players of less quality that make a lot of money but have also cost us a large transfer fee. So, without sounding like Le Boss himself, I think we've got a good deal. A player of Walcott's quality probably runs in the high £30million range in the market these days, so we've already saved that much. Granted, we've been paying his salary for the last decade but it's not as if he's been a completely ineffective player during that time. The lads going to be under a lot of pressure this season, no doubt, but he strikes me as a player that thrives under that sort of pressure, so I (forever the optimist) am going to look forward to a break out season for the young Englishman. Theo! Theo!